Welcome Palo Alto High School 1961 classmates! If this is your first visit, read below to see how to get started. Make your profile page and personalize it by adding pictures, YouTube Videos, and Playlists. Discover how to do it all right on this page! Can I join the site even if I don’t plan to attend a reunion? What Screen Resolution is recommended for Instant Messaging? Can I turn off my Instant Messaging (IM) feature temporarily? Can the IM window be moved? Can I start more than ONE (1) Private Chat? Will IM work on my IPhone or SmartPhone? How do I get verified? When you register and save your Classmate profile, an email alert is sent to the Site Administrator. As soon as the administrator receives it, they may send you an email with several questions for you to select from to validate that you were in fact a member of Palo Alto High School. If you do not know the answers to any of them, do not fret, but simply send them back a message that you do not know the answer. They will have several more questions that they can send back as alternate questions. After you reply with the correct information, they will then verify your account and notify you via email of your activation into the system. If all else fails, someone will call you to verify your account. Why do I need to be verified? We want a website home where people feel more comfortable participating without fear of search engines accessing their information or 'trollers' pretending that they are a classmate when in fact they are not - which does happen on some of the other sites. So, although this may be somewhat time consuming or cause a bit of a delay, our hope is you will see the value in it for us all of us. Can I join the site even if I don't plan attend a reunion? Yes. Even if you do not plan to attend a reunion, it is hoped that there are old friends on this site that you would like to reconnect to and for that purpose you can still join the site. Married Couples - Sharing the same email address for login: Married couples who share the same email address: Make sure you each have unique passwords for your logins. This is how the website differentiates you. GETTING STARTED: Please take a few minutes of your time to create your Classmate Profile. Click the Classmate Profiles tab in the top left navigation. You will be taken to a listing of the GBHS class of 1975. Click on your name and follow the instructions to create your login. If you cannot find your name on the Classmate Profiles page, please use the Contact Us page to have your name added. Once you create a profile, you will also be able to see the profiles of your fellow classmates and interact with them. You don't have to finish your profile all at once. Come back whenever you want to add to or update your information, or add more photos. WHAT IS "REMEMBER ME"? : If you click "Remember Me" when you log in, you will not need to log in next time you go to the site. You can log in from computers other than your home computer but you will need to enter your password. On computers that you're planning on using in public places such as libraries, do not check this. Aren't cookies bad? Answer: No. The "cookie scare" of the late 1990s was largely based on misconceptions that cookies stored on your computer's hard drive somehow violated privacy. Erroneous information regarding cookies has long since been corrected, and cookies are a common programming practice used today by some of the Internet's largest websites. There is nothing that our website does with cookies that will in any way jeopardize your privacy, store personal information about you, or submit your personal information to other websites. You can upload .jpg, .gif, .bmp and .png files, but not .tif. An editing feature is within the software to help you edit your pictures. You can crop out anything you don't like. The Playlist will also be placed in your Playlist box on your Edit Profile page. Click in your Playlist and paste in the code (Control/V). 1. Alternate Email(s). Enter 1 or more email addresses, if you would like to receive duplicate copies of emails sent through the web site. If you only want 1 copy, leave these fields blank. Please note, only your primary email address can be used to log into the web site. 2. Street Address. Your street address is visible only to the Site Administrator and is hidden from your Classmates unless you specifically choose to share this information in your Profile area. 3. Street Address 2. Same street address privacy rules above apply to this field. Note that we will never use personal information for anything other than contacting you regarding issues directly related to the Great Bend High School Class Of 1975 web site. Profile Visibility: Allow only fellow Classmates to view my Profile details. This will block the public and search engines from accessing your Profile. Leave this box unchecked if you wish to allow the public (friends, co-workers, family members, etc.) to view your Profile details. Contact Details: Allow Classmates to see my address and phone number (this information is hidden from your Classmates unless you check this box). Birthday: Allow Classmates to view my Birthday. This option allows Classmates to see your Date of Birth in your Profile and on the home page 30 days prior to your Birthday. You can also subscribe to Classmates who have not yet joined the site, which will generate an email to you when the Classmate joins. Subscribing to Profiles will also notify you when a Classmate has an upcoming Birthday. Forums are intended for reconnecting with old friends, making new ones, sharing memories and stories, as well as current interests. So let’s be courteous to everyone on our website. In order to participate in Instant Messaging the only requirement is that you have the latest version of the Adobe Flash player. If anyone you're attempting to chat with is having trouble with the Instant Messaging feature, they should go to www.adobe.com and upgrade to the latest version of the Flash player. The Members Online panel is positioned to the lower right of the web site. It can be expanded by clicking anywhere in the title (top bar) area. Clicking the title area again will minimize the window. To chat privately with a fellow member simply click his or her name in the Members panel. Each Member's name you click on will spawn a private messaging window as seen below. You can open up to 4 private messaging windows at any 1 time. Chatting with another member is simple: Click your mouse anywhere in the bottom region of the window to enter your message then press your <Enter> key to send the message. That's all there is to it — you can now easily chat with fellow members as you browse the site. SCREEN RESOLUTION: For best results use a screen resolution with width of 1280 pixels or greater. Any of today's wide screen monitors will have at least a 1280 resolution. At this size the Members panel will never cover any site content. If you are using a smaller screen resolution the Members panel will cover site content, but it can be easily minimized or closed completely by clicking the X in the upper right corner. YOUR PHOTO: Your "Master Photo" is displayed at the top of the Members panel. All messages in the chat window are also preceded by your Master Photo. If you have no Master Photo you will see a default image. Your Master Photo cannot be set from within the Instant Messaging interface. To set your Master Photo click on the Edit/Upload Photos link on the web site and follow the directions on screen. SEARCH FOR MEMBERS: If there are many members logged in at the same time, you can quickly search for members by clicking "Search for members" in the Members Panel and entering the first few letters of the member's name. SOUNDS: A sound will be heard whenever a new member logs into the web site. Another sound will be heard every time a member sends you an instant message through the web site. Sounds can be disabled by clicking the speaker icon in the Members panel. TIP: Hovering over a member's name will pop up a window allowing you to quickly jump to the member's Profile page. TOOL BAR: The icons on the tool bar allow you to insert emoticons, bold and/or italicize your text, change font color, and quickly jump to these help instructions. You can also start a Private Chat session. PRIVATE CHAT: Clicking the "Private Chat" button in the tool bar allows you to jump to a larger private chat environment that allows the sharing of photos, webcam feeds, and YouTube videos. You can also invite additional members to the private chat. You can start as many Private Chat sessions as you'd like (as long as you can keep up)! Online: You are currently available and accepting Instant Messages. Away: You are online, but not currently at your computer. Do Not Disturb: You are online but wish to block incoming Instant Messages. Can I turn off my Instant Messaging (IM) feature temporarily? Yes. Click on the ‘X’ in the upper right hand corner of the IM Member online. You will get a pop-up saying: “You are about to turn off the Instant Messaging Feature. If you wish to turn it back on, simply close your browser and come back to our website.” Once you come back to our website, you might have to log back in. DISABLE INSTANT MESSAGING: If you wish to completely turn off the Instant Messaging feature you can do so by clicking on the Edit Profile link and deselecting "Allow other members to send me Instant Messages through the web site." 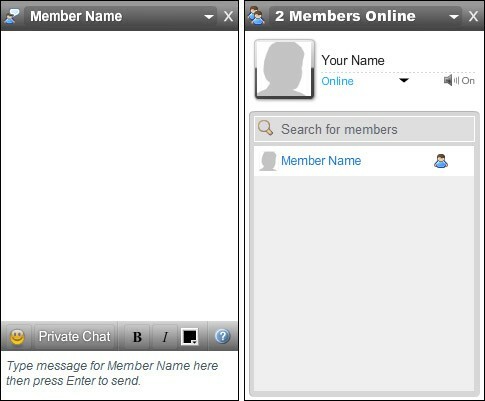 If you disable the Instant Messaging feature your status will automatically be set to Invisible, no other members will see you online, and you will also no longer see any other members currently logged into the web site. Can the IM window be moved? No. It works best along the bottom of the screen. You can launch up to 4 IM windows at any one time. Although these windows do pop up in front of site content, they can be easily minimized or closed. You have full control over what IM windows appear and when. Can I start more than ONE (1) Private Chat? Sure you can. You can be in unlimited simultaneous Private Chats; if you can keep up with it. Will IM work on my iPhone or Smartphone? No. Most don't support Flash to this day. At least for the moment, if you want to IM you'll need to use a regular computer. We are working on a non flash version. In order to participate in this Live Chat the only requirement is that you have the latest version of the Adobe Flash player. If anyone you're attempting to chat with is having trouble loading the Live chat, they should go to www.adobe.com and upgrade to the latest version of the Flash player. This is where conversation occurs. At the bottom of this panel is the Control Bar. The Control Bar is used for controlling various elements of your chat. Messages can be entered under the Control Bar. Pressing the Enter Key or clicking the Send button makes your message visible to all participants. All messages in the conversation window are preceded by your "Master Photo". If you have no Master Photo you will see a default image. Your Master Photo cannot be set from within the Live Chat interface. To set your Master Photo click on the Edit/Upload Photos link on the web site and follow the directions on screen. NOTE: New members joining the chat room will see the last 20 entries made by other participants, allowing them to quickly see the current conversation and begin participating. This is the "Media Window." Members in the chat room can use this window to share photos, YouTube videos, and live webcam feeds. These items can be shared by using the Control Bar. Member is sharing a webcam. Member is currently watching your webcam. NOTE: All member names are clickable to their Profile pages. If you want to know more about the person you're chatting with, click on their name and their Profile will launch in a separate window. The Control Bar is used for sharing media and adjusting font, font size, and font color. Share a YouTube video with fellow members. To share a video, open YouTube in a separate browser window or tab. Find and play the video you wish to share. While watching the video select and copy the web address in your browser's address bar. You can also copy the "embed code" YouTube provides for sharing videos on other web sites. Return to the Live Chat window, roll over the YouTube icon, and paste the YouTube address into the white box. Click "Share" or press your Enter key to share your video with all participants in the chat room. Share a picture. You can enter the web address for any picture online you wish to share, or you can upload a picture from your own computer to share with fellow members. Click the webcam icon to allow other participants to see you. If you want members to also hear you simply plug in a microphone. Whenever a participant shares a webcam, a webcam icon will appear next to their name in the Members panel. Click the icon to watch the feed. Click the webcam icon next to a different member's name to switch to a different feed. If you wish to turn your webcam off, click the "Stop Sharing" button on the monitoring window (if it's not currently open you may have to click the webcam icon on the Task Bar to open it again). IMPORTANT: There is no 3 way or voice conferencing abilities in this Live Chat application. You can only watch 1 member's webcam feed at a time. Likewise each member can only watch 1 other member's webcam feed at a time. If you want a member to see and/or hear you, and you also want to see and/or hear that member, you must monitor the member's webcam feed, and the member must monitor your webcam feed. Pay attention to the watching icon ( ) so you know when other members are watching your webcam feed. Is there a way for 1 person to share audio and video with the entire chat room at once? There is. If one person (let's call this person The Presenter) wants to address the entire group of chat members, then all parties in the chat room should click on The Presenter's webcam icon. While all participants would be able to see and hear The Presenter simultaneously, everyone would need to type their responses back to the Presenter, because at most The Presenter could only see and hear one other person (because The Presenter too can only monitor one feed at a time like any other chat participant). If you have your webcam monitoring window open while chatting you will see this symbol followed by the number of people who are currently watching your webcam. NOTE: The webcam icon will only appear next to members' names who are sharing a webcam. If a user has not enabled a webcam, no webcam icon will be present. Use these font tools to select font, font size, bold, italic, and font color. Click the help icon at any time to return to these live chat instructions.